Through the years the Lord has offered, this apparition miracle, the presence of angels. Some have come to stay and others have come on special missions. It is by the grace of God that Mrs. Valerie Perez has been blessed to be able to see and speak to them. It is the grace of God, which lies as a soft mantle on top of the blessed terrain of Koyari, which keeps the presence of 10 Angels, who were assigned to stay at this blessed terrain and assist the Visionary. 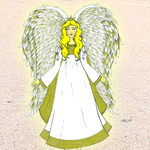 At Modanza, there’s one angel called Marie Esther, she has blond hair, blue eyes, she is tall (around 1.80m) and has a beautiful smile. She has a small crown on her head. She is there 3 times a week. Every time I pass by in my car, if it’s on a Monday, Wednesday or Friday, I see her. 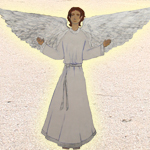 One of the funny Angels is Amadeus. He has grey eyes, brown skin and dark brown hair. His wings are white though. He has a white robe and carries a bag and at the right side of his head there’s star, which he claims to fall every time is naughty. He whispers things in the Visionary’s ear, which sometimes makes her laugh. Amadeus’ clothing has changed after he was assigned to stay at Koyari. 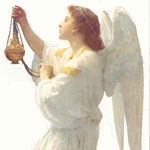 The other 8 Angels arrived after the apparitions moved to Koyari in 2001. Jesus Himself has offered them this place for Aruba. Their names are their real names in heaven. 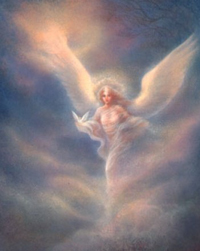 There are currently 10 Angels who are steady at Koyari. Each has its own mission and personality. These Angels have arrived in a stretch of 15 years. Each of them has a name which they were already given in heaven prior to coming to Aruba. Koyari is their place on earth. Of course it’s important to know their physical places, as they all have a place which most of the time they are at. So when you come to the terrain of The Voice of Jesus at Koyari, you can greet them and speak to them, they will hear you and pray for you. Marie Esther’s place is always at the left side of the entrance gates of the blessed terrain of Koyari. Amadeus’ place is at the right side when entering the entrance gates of the blessed terrain of Koyari. Amor y Fe’s place is in the top of the bell tower, where the bell is. Strea Bunita’s place is in the garden behind the statue of our Blessed Mother, the Cross and the the statue of Jesus our Friend and Savior. Milagrosa’s place at the statue of the Assumption. Inocente’s place is together with Inocencio flying on top of the blessed the terrain of Koyari. Inocencio’s place is together with Inocente flying on top of the blessed the terrain of Koyari. Coronita’s place is on top of the roof of the Chapel Creation of the Entire World. 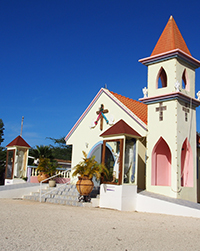 Perlita’s place is at the white statue of Jesus on the blessed terrain of Koyari. Xiamanthijn’s place is on top of the entrance arch of the blessed terrain of Koyari. All Angels have their place on the terrain at Koyari, though they move around. Only Amor y Fe doesn’t really move. He’d like to stay to monitor things. I speak to Amadeus and Marie Esther more easily as I’ve known them longer. Coronita, Perlita, Xiamanthijn are different – they are strict and I only go to them when it’s needed. All the Angels have different tasks. These 5 Angels are the only ones who ascend to heaven. Coronita, Perlita and Xiamanthijn ascend once a week to heaven. Inocente and Inocencio ascend 3 times a week. Angels have no lines in their faces, they are perfect and beautiful. They shine, their lips are pinkish. They have long hair. 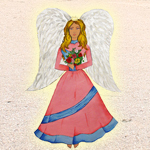 Some of the Angels have flowers either in their hands or on their clothing or in their hair. The presence of flowers is a dedication of their love and grace to the Mother of Heaven, whom they deeply love. The angels have a small face, small mouth, small eyes, small nose, small ears, small hands, long nails, long hair and some short hair. Some tie their hair. The skin color varies from white through light brown and brown. But their skin is beautiful. The color of their eyes varies from grey, green, blue, black, a mix of green and yellow, etc. Their wings are higher than their heads and are pointy at the upper end. I can’t see feathers, but rather layers of something indescribably white and in some places on the wings there is one layer. When they descent their wings are closed in front of their faces/bodies and as they stand still their closed wings make a vertical movement towards their bellies (where a woman usually holds an unborn child), then again going a little higher than their chests and opening horizontally. When they ascend they close their wings in a vertical manner in front of their faces and ascend. They usually greet by holding the palms of their hands together and say goodbye by crossing their arms in front of their chests. There’s a lot of brightness around them. They all wear long white robes, sometimes with a string on their waste and sometimes not. And some of them are bare feet and others have open sandals. 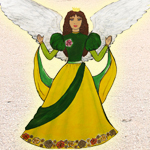 The most powerful angels have colored clothing. 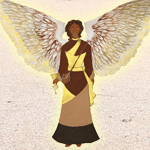 Why colored, because they were chosen by Jesus so that the world could have protection by the angels to do their jobs as it should be done. Marie Esther has beautiful blond hair and blue eyes. She is very soft, likes animals, plants, nature. She likes to see things to speak about them and she asks me why they are there. She’s very observant. She has a bouquet of multicolored flowers in her hand and has a small crown on her head. Amadeus has a bag and a trumpet. He is very playful. He likes to get into a hammock, switches fans, lights and air conditioners on and off, likes shiny things, things that turn around / rotate etc. Sometimes Amadeus goes and picks flowers to bring to the Angel Milagrosa. Amor & Fe has a bouquet of red roses in his hands. His hair is white/grey and his eyes are also grey-like. His eyebrows are white. Amor y Fe rarely goes anywhere. He remains at Koyari and has the duty of being the main keeper or caretaker of the terrain. He loves Koyari. He gives everyone who enters in the Chapel a red rose, even though you don’t know it. The flower is transformed into a glorious rose and sent to your soul. When you pray he comes down and sits in the seats of the Chapel. He touches the papers, the Bible etc. so it catches your attention to show you that you need to read them, etc. Strea Bunita has a something in her hand where rays come out of. She goes everywhere to check things out, to the hospital, jail, home of the elderly, the widows, and family homes. She fills the empty souls of people who have no faith, who don’t want to pray, and live in a disorderly way with splendor. She says that they are ungrateful – that Jesus and the Virgin Mary came for them, but they don’t see the value of this – and that they’ll see it when it’s too late. There’s still an opportunity to take the goodness, but they lose the grace, … they keep losing it, they lose it every day. They dare say that they are Catholic, but they are far from being Catholic. They are not, truly not. They are far from being. Sometimes Strea Bunita goes to Church when I go, and she says that I will not see some people of those who were there again; When they’re done they won’t come any more: they’ll come for a baptism, a first communion, for a wedding, or when there’s a funeral in a few years. They don’t live prepared, it’s necessary to live prepared because you don’t know what’ll happen to you tomorrow. This is the point that she makes. Strea Bunita says, that during the 3 days of darkness she’ll illuminate some homes in the world. She’ll place at least the brightness of one of the stars on her robe in each of these homes. Milagrosa has a fringe of hair. Her hair is black and has brown slanting eyes. Her yellow and green clothes have a lot of flowers on the bottom edge; these flowers are in groups of 3 flowers, but all different colors. She also has red, purple and pink flowers in her hair and on her chest and a small crown on her head. Milagrosa is very much into prayer – she gets sad rather quickly when things turn bad like divorces, the effect of this on children. She is sensible on subject likes these, also when kids run away from home, or get pregnant at an early age; She worries also for the elderly who are not visited. Inocente and Inocencio say that “When you die, we will bring the news to the Visionary if your final journey has ended in Heaven, Purgatory of hell. We also keep an eye on the growth of your spiritual life: if you go to Church, Prayer, Adoration, if you pray within the family and pray the Holy Rosary every day. Trust that all of us Angels will do wonderful things. If the Visionary asks us to accompany any of you on your travels, we will stay until you return. 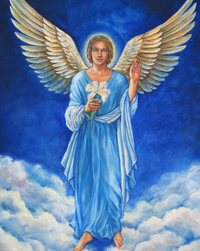 We ascend to the highest level in heaven 3 times a week together with Coronita, Perlita, Xiamanthijn, to get strength and bring news to the Visionary and tasks for the other Angels at Koyari who don’t ascend to heaven regularly. We also bring news of those who have passed to the Visionary.” Inocente and Inocencio are usually very busy, sometimes they bring me tasks that I need to comply with. Inocente and Inocencio are twins, they look very much like each other and go always everywhere together. Coronita is strict and very beautiful. 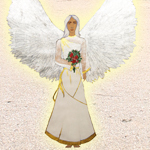 She has a higher rank than the other Angels – that is why. Coronita could be seen as a kind of ‘intercessor’ for the souls in purgatory. She goes and pleads to the Lord to release them, depending on the prayers of the faithful, so they can go to heaven. 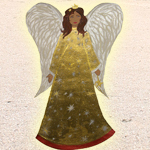 She will also bring the news of this joyful transition to other Angels at Koyari. Coronita says that people are lazy for prayer. Other islands are more devoted than Aruba. She says that it’s a pity, because the Virgin Mary chose Aruba. Perlita has a very important task. She has a book in her hands. Her robe is purple and pearl and is at the southern door. 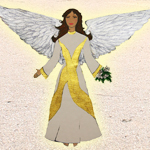 Her task is to monitor your spiritual growth see how she can help you grow. She tells me sometimes that the spiritual level of a person is very low, please talk / pray to/with him / her, or a person is not going to Church or skipping prayers / rosary or comes to the Apparitions when he / she wants. She is very close to Xiamanthijn and Coronita and the 3 of them will discuss these issues. She sees if you advanced in faith and understood the call of being at Koyari. She says to bathe with Holy Water, to drink Holy Water to mop you house with Holy Water. Love Jesus, the Virgin Mary, Angels and Saint from your entire heart. Comply with the Sacraments, the 10 Commandments. Tries to help you to believe in the Gospel, pray every day, read the Bible and pray the Holy Rosary. Always finish the Rosary. Don’t pray it halfway, finish it. Jesus isn’t half for us, He is completely for us. She also says that there are a lot of weak people; they fall into laziness of coming to prayer, to Church, you will start skipping etc. At the end your faith goes down to the bottom and evil will rise in you and advancing in faith will be a problem. It will be in your way of coming to Church, to prayers, etc. Xiamanthijn likes to laugh. Her robe has silver, diamonds, like 7 shiny colors. She’s bare feet. She has also a crown. Her hair color is 3 color, brown, goldish etc. Her eyes are of light color blue / greenish. She also goes to heaven once a week. With Xiamanthijn everything has to be correct. The things of God everything has to be straight. You can’t have 2, only 1. Xiamanthijn always talks about debts that people need to pay. Also to keep everything clean, because cleanness brings happiness, filth will push people away. When I receive the apparition in the early morning hours, they all come into the Chapel to accompany me and pray with me, waiting for the Virgin Mary’s apparition. Sometimes they go abroad when I ask them to check on some things for me or sometimes they approach me to go somewhere to check on things that are important. They always tell me when they are leaving. They are also always available to accompany someone on their travels, if they ask me for this. It’s a joy to be able to see and speak to these Angels who look out not only for the blessed terrain at Koyari, but for all the faithful and me. They keep me very busy sometimes with information and things that are requested from me. They are a true blessing.